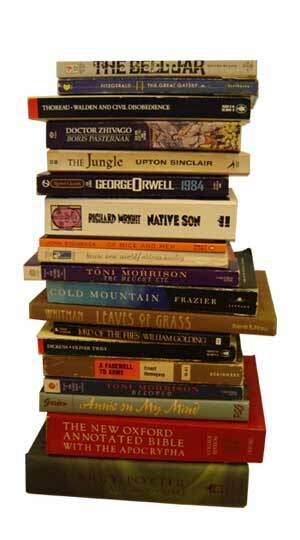 Today marks the beginning of Banned Books Week, and with it, LibraryThing’s latest bookpile contest. Here’s a selection of books from my library that have been banned/censored/challenged at one time or another – let’s see what you all have. Banned Books Week, according to the American Library Association, has been observed since 1982, and “reminds Americans not to take this precious democratic freedom for granted.” Check out their website for more details. Wikipedia also maintains a list of banned books, and Google even has a page up. 4. Do it all by September 30th. We’ll announce the winner on the blog the following day. *No hats this time, but here’s proof of the first official LibraryThing Pirate Hat before it was sent all the way to Topper in Nashville.